Vision of The Fjords - inspired by UNESCO World Heritage surroundings wins prestigious Ship of the Year 2016 award at global shipping exhibition SMM in Hamburg. 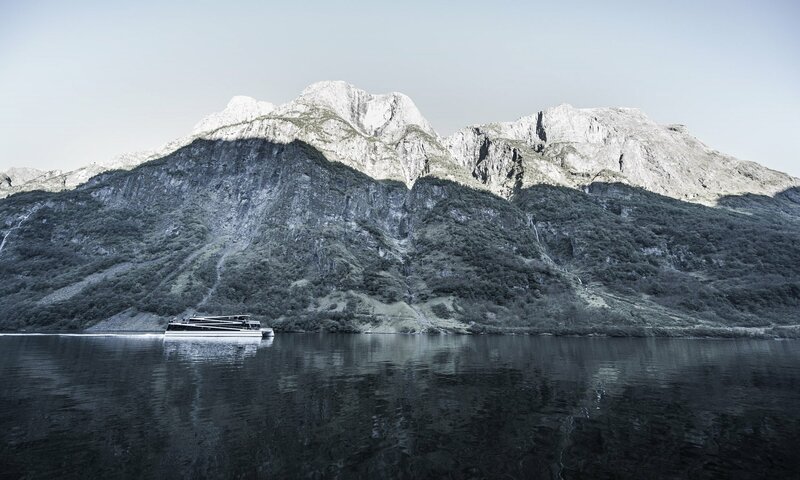 The blend of environmental responsibility and passenger experience made Vision of the Fjords this year’s standout craft. Vision of the Fjord on route to Flåm harbour. THERE`S NO NOICE BUT NATURE You’re standing on top of a masterpiece of contemporary design, slicing silently through crystal waters while snow-capped mountains crowd around – seemingly as interested in you as you are in them. You are in a unique UNECSO World Heritage listed habitat, in an environmentally friendly vessel that looks, sails and delivers experiences like nothing else on the water. It’s an awe-inspiring voyage, not only powerful enough to forge lifelong memories, but also to win 2016’s coveted Ship of the Year award. This is Vision of the Fjords. 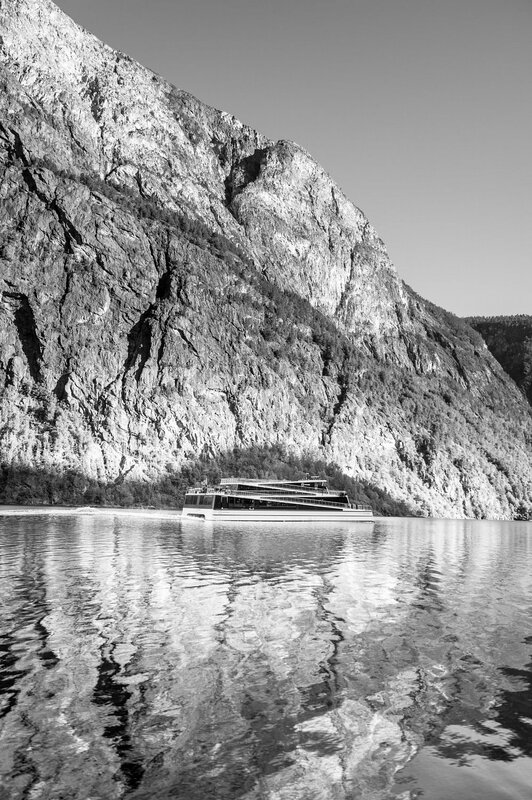 INNOVATIVE DESIGN Its design pays homage to the zigzagging mountain paths of the Western Norwegian fjords, while utilising an environmentally friendly hybrid propulsion system to bring passengers closer to nature and minimise its own operational footprint. The vessel’s unique form allows visitors to literally climb over it to get as close as possible to the stunning scenery. Sweeping windows, and comfortable lounges, mean those that want to stay inside can still enjoy outside through an inspiring glass panorama. Buy your ticket on the right boat. Get closer to nature and minimise your own footprint. 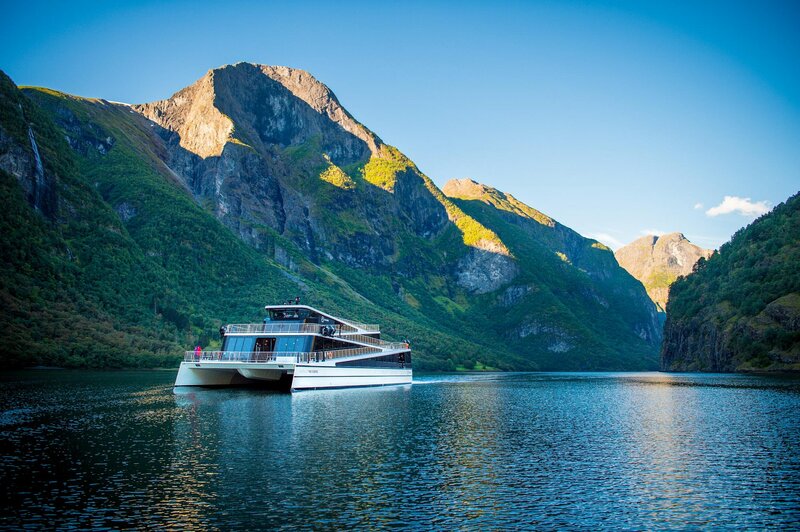 ENVIRONMENTAL RESPONSIBILITY Built to carry visitors through the heart of spectacular Nærøyfjord, Vision of The Fjords mimics and protects the dramatic nature surrounding it. Electric motors allow silent, emission free running in Nærøyfjord, with a specially designed hull minimising wake to reduce impact erosion on the vulnerable shoreline. 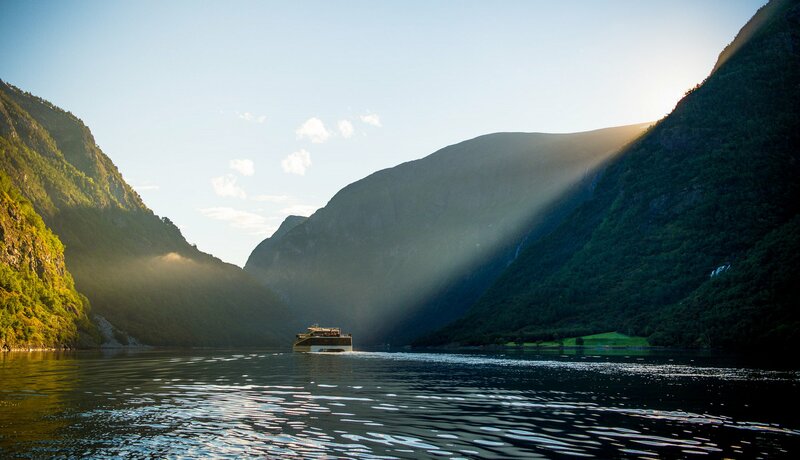 EXPERIENCE VISION OF THE FJORDS Vision of The Fjords has multiple daily departures, ensuring easy connections with road, rail and other vessel links, making around 700 voyages a year, all year round. It is the only tourist ship on Nærøyfjord to do this, thus opening up the area to visitors in off-peak periods and exposing them to the singular beauty of Winter, Spring and Autumn months. A one-way trip between Flåm and Gudvangen – passing amongst 1800m high mountains, cascading waterfalls and quiet settlements – takes around one and half hours. Experience 1800m high mountains, cascading waterfalls and quiet settlements. UNESCO World Heritage landscape in one of the most popular fjord areas in Norway.